Hos Dorte: Let's have a Party! A Mid Way reminder for HM&FMC. Let's have a Party! A Mid Way reminder for HM&FMC. 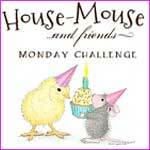 for the ongoing challenge at House Mouse and Friends. This stamp is new to me, it's called "Happy Cone" and I just love it! It's the perfect stamp for a birthday card rather your 2 or 92! Everyone will smile when they see these sweet mice lighting the candles. The card is made for a little boy in my familie who is turning 4 years next week! 4 candles, 4 mice , congrats Daniel! I had to put this little one on the backside of the card. HMD is offering a Lucky player a $20 Gift Certificate to go shopping at the official House-Mouse Designs(R) site! As You Like It Challenge- Favourite Stamp Brand, House Mouse. I love their cute images and it's always easy to find an image for any occation. Love your birthday card Dot! Especially the winky face on the back! Thanks for being on our gallery at Seize the Birthday and hope to have you back again soon! Me again! Another absolutely gorgeous card. Thanks for joining in with The Ribbon Girl March card challenge and good luck in the prize draw! Så morsomt kort du har laget Dorte! :D Musene er jo bare så herlige, og fine mønsterark som passer perfekt til barnekort! Great card. I love the image. How sweet that it's for someone turning 4 and that there are 4 mice and 4 candles. Spring, A Dt card for HM&F. Let's Have A Party! 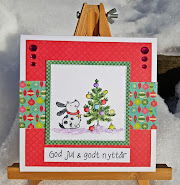 A DT card for HM&FMC. Challenge E-F-G at ABC Christmas Challenge.